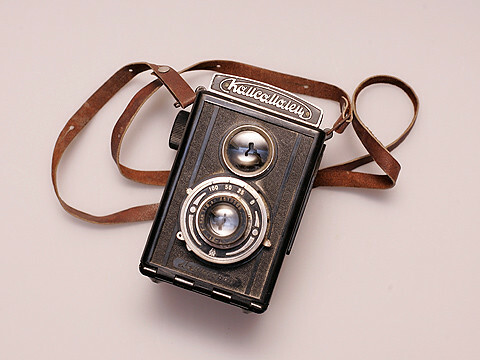 The Komsomolets („Комсомолец“) was a sophisticated pseudo TLR, almost like the German pre-war Voigtländer Brillant. It was named "комсомолец", meaning member of the Komsomol, the All-Union Leninist Young Communist League, the youth organization of the former Soviet Union. Its plastic body design was taken over for the Lubitel, a real TLR. The "комсомолец" was produced from 1946 to 1951 by GOMZ. Frame size was 6x6cm, but the first Komsomolets cameras had a red window for 6x9cm frame size since early Soviet 120 film had just 6x9 frame markings on the backing paper. The camera had a Triplet-21 6.3/80 lens and a shutter with speeds 1/25, 1/50, and 1/100 sec. plus B mode. This page was last edited on 29 February 2012, at 20:44.